I knew it was bound to happen sooner or later: a bust up, a blow out, the discovery of an out and out lemon undeserving of its place in the vaunted Top 100. For some reason, however, I never expected it to happen at Batali and Bastianich’s Esca. Mario and Joe, respectively, are the forces behind an impressive group of critically acclaimed restaurants, including Babbo, Del Posto, Lupa, Otto, and the Eataly megaplex. Together they’ve taken a cuisine which for generations dwelled in a red sauce ghetto and forged an authentic four-star Italian experience. 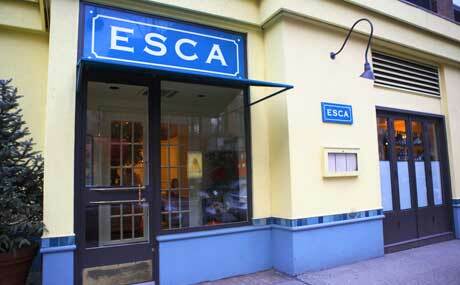 These restauranteurs know what they are doing – which made my recent meal at Esca all the more disappointing. For starters, the rock ‘n’ roll is too loud by half and the lemon yellow walls are in need of a fresh coat of paint. (On the first day of spring – with the weather happily cooperating – could there be anything more off-putting than looking out a window and realizing that the Lincoln Tunnel traffic crawling down Ninth Avenue commands a more serene vista than the scuffed and shabby room where you’re about to dine?) Pressed for time, the reservationist forgave my late arrival yet things got off to a bumpy start when a few simple menu questions left my waiter befuddled. 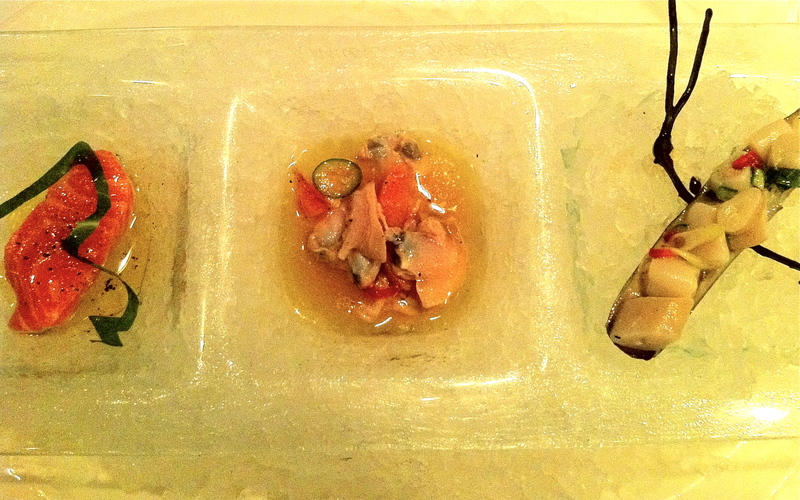 So without help I settled on the two-flight tasting of crudo for which the restaurant is famous. 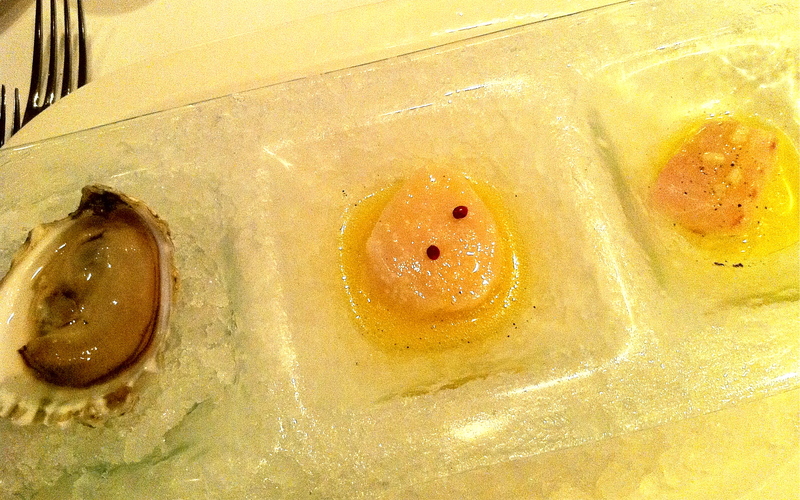 Arriving first, a trio of winners: a plump oyster, satisfying and briny, diver scallop in tangerine-pressed olive oil and peppercorns, and my favorite, local porgy with flaky sea salt. The second plate offered more mixed results: beautifully marbled Arctic char was oddly cut and improbably stringy, a Cherry Stone clam ceviche had all the unpleasant mouth-feel of a spicy rubber band, and yet razor clams with chilis, scallion and mint were delicious and invigorating. (I could easily pop back a dozen and not bat an eye.) 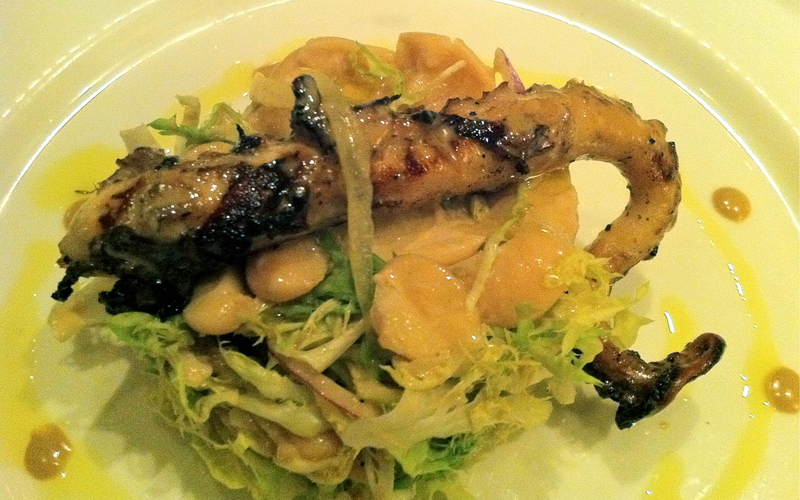 The inconsistencies continued with the arrival of polipo, a perfectly charred – and for $17, entirely too small – piece of flavorful octopus on a bland bed of giant corona beans, which were themselves perched atop a flavorless mound of undressed frisée. 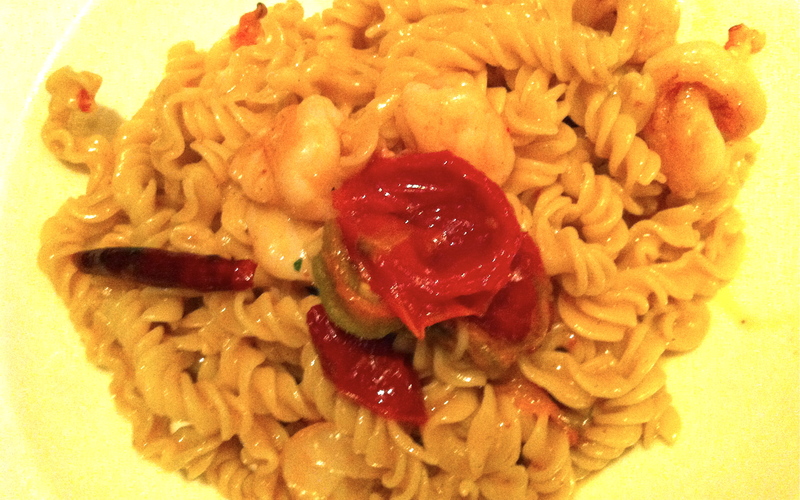 House made fusilli with gulf shrimp and zucchini flowers was ultimately fine – yet the reality of a few wilted greens tossed into some pasta didn’t quite deliver on the promise inherent in those ethereal spring blossoms. Nobody seems to be in charge at Esca – the contrariety is evident not only between courses but often within a single dish. It’s all the more frustrating because you can sense the good intentions even if the follow-through never delivers. Dessert, alas, didn’t deliver either – though I must admit it never even got the chance. I mentioned to the waiter at the start of service how I needed to be firmly out the door by 7:30. At 7:40 she wandered over oblivious with a dessert menu in hand. That inability to sustain a thought, I’m afraid, explains the Esca experience in a nutshell.